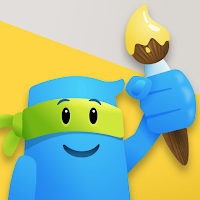 Brush Ninja is a free tool for creating animated GIFs. Unlike some similar tools, Brush Ninja works equally well in the web browser on a Chromebook, Windows or Mac laptop, iPads, Android tablets, and iOS and Android phones. To make an animated GIF on Brush Ninja simply go to the website and start drawing on the blank scene editor. You can draw as many scenes as you like in Brush Ninja. When you have drawn all of the scenes for your animation press the play button to preview your animation. If you are happy with your animation, you can download it by clicking the export option. If you don't like a part of your animation, you can go back and edit any of the scenes that you need to adjust. Watch my video that is embedded below to see the whole process in action. Animated GIFs can be a good for displaying the steps of a solving a math problem. I’ve also seen them used to illustrate parts of speech. And my friends who teach physics can use animated GIFs to illustrate key physics concepts. Those are just a few of the ways that you could use animated GIFs in your classroom.